Market analysts are positive on retail, media and aviation sectors in which the government allowed more foreign direct investment in September 2012. Investors can expect the 2012 stock market rally to continue well into 2013. That's the view from most Indian and foreign brokerages. The Bombay Stock Exchange, or BSE, Sensex is up 24 per cent till December 14. There is now widespread belief that pro-industry decisions by the government, a fall in interest rates and economic recovery, however small, will work their magic on equity markets in the next few quarters. An ICICI Securities survey in December found that 60 per cent fund managers expected the market to be up 15-20 per cent after a year. In August, only 8 per cent were bullish. 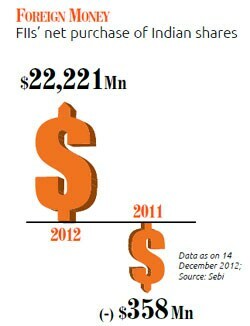 In 2012, till December 14, foreign institutional investors, or FIIs, injected Rs 1.17 lakh crore into Indian equities. In 2011, they were net sellers for Rs 2,714 crore. "We expect FII inflows to be fairly healthy in the coming year due to India's relatively better growth," says Gaurav Dua, head of research, Sharekhan. Market analysts are positive on retail, media and aviation sectors in which the government allowed more foreign direct investment, or FDI, in September 2012. Some are positive on consumer discretionary companies, which they say may gain from rising incomes. "With opening up of the multibrand retail to foreign capital, the companies will get high investor interest in the New Year," says Pankaj Pandey, head of research, ICICI Securities. This year till November 30, the Store One Retail India stock had risen 461 per cent to Rs 50, followed by Pantaloon Retail (65.5 per cent to Rs 210) and Shoppers Stop (65 per cent to Rs 428). In the media sector, digitisation will provide opportunities to companies in film, cable distribution and broadcast segments. Cable TV distribution in Delhi, Mumbai, Kolkata and Chennai went digital on October 31. In just one month, the shares of Sun TV, Hathway Cable & Datacom and Zee Entertainment Enterprises rose 24 per cent to Rs 408, 16 per cent to Rs 271 and 3 per cent to Rs 195, respectively. Digitisation will help companies stabilise revenues by checking under-reporting of subscriber numbers by cable operators. "Opportunities from digitisation will exceed most estimates," says David Pezarkar, head, equity, Daiwa AMC. Consumer sectors, on the other hand, will gain from a rise in the country's per capita income, which has been growing at 12 per cent a year for the past five years. "Education and leisure can do well in 2013. However, retail investors should wait for clarity on the winners as revenue will shift from unorganised to organised players. Some consolidation is also expected in the organised space," says Ravi Shenoy, assistant VP, mid-cap research, Motilal Oswal Securities. "Sunrise areas such as fast food chains and health and fitness hold out promise for the long term," says VK Vijaykumar, investment strategist, Geojit BNP Paribas Financial Services. "Stocks of tyre companies could also do well in 2013 as rising automobile production increases demand in the replacement segment," says G Chokkalingam, executive director and chief investment officer, Centrum Wealth Management. Tyre makers could also get a boost from falling rubber prices, which hit a two-year low of Rs 161 per kg in December. FMCG: The BSE FMCG, or fast moving consumer goods, index has beaten the Sensex this year by rising 50 per cent till November 30. "FMCG will remain attractive in 2013, but is unlikely to show the same intensity as it did in 2012. It may rise less than the index as valuations are on the higher side," says VK Vijaykumar of Geojit BNP Paribas Financial Services. This year till November 30, FMCG majors ITC, Hindustan Unilever, United Spirits and Nestle India have risen 50 per cent to Rs 298, 34 per cent to Rs 538, 302 per cent to Rs 1,992 and 17 per cent to Rs 4,765, respectively. One can bet on ITC and Godrej Consumer Products, say analysts. Godrej Consumer Products: In financial year ended March 2012, the company's income was Rs 3,310 crore as against Rs 2,537 crore in the year-ago period while net profit was Rs 604 crore compared to Rs 434 crore in the yearago period. On December 14, the stock was trading at Rs 717. Its price-to-earnings (P/E) ratio was 49.30 compared to the industry average of 34.69. "The company will gain from the agreement for exclusive rights to include the hair extensions business in Kenya and exports to other East Africa geographies in its partnership with the Darling Group," says Shantanu Deb Mookherjea, ED, LSI Financial Services. ITC: In 2011-12, the company posted a net profit of Rs 6,162 crore, up 23.5 per cent from Rs 4,987 crore in 2010-11. According to a November Deutsche Bank report, the strategy to spread out price increases has worked well for ITC. It has kept earnings in the cigarette business steady in spite of a 21 per cent duty increase. Since September 2011, ITC has increased prices of cigarettes by 23 per cent. Despite this, volumes have held up. "ITC can touch Rs 327 in the next 12 months," says the report. On December 3, it was at Rs 296. BANKING: The banking index fell 30 per cent in 2011. This year till November 30, it has risen by rising 52 per cent to 13,952. "The performance of private sector banks, which continue to maintain significant growth in profit and keep non-performing assets under control, has also helped. 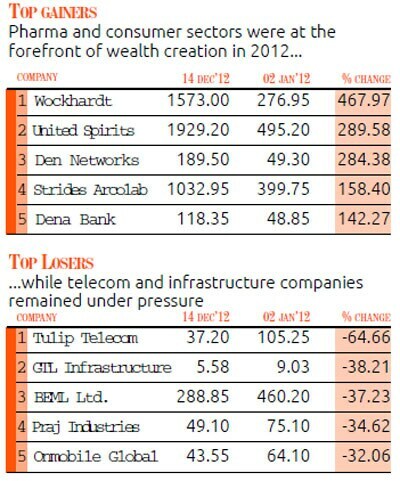 The sector will continue to do well in 2013," says Centrum's Chokkalingam. Any fall in interest rates will reduce banks' NPAs and increase profitability. Between January and November this year, Yes Bank has risen 90.5 per cent to Rs 442, followed by IndusInd Bank (85 per cent to Rs 417), Axis Bank (66 per cent to Rs 1,316), HDFC Bank (65 per cent to Rs 704), Kotak Mahindra Bank (59 per cent to Rs 669) and ICICI Bank (58 per cent to Rs 1,098). Karvy Stock Broking said in November that J&K Bank and Karur Vysya Bank could touch Rs 1,500 and Rs 535, respectively, in the next few quarters. On December 3, they were at Rs 1,373 and Rs 475.50, respectively. AUTOMOBILE: The BSE Auto index has risen 34 per cent this year due to better earnings by companies. Experts are positive on the sector. "The next six months will be good for auto stocks as economic downturn is bottoming out and there is revival of consumer sentiment, especially in the car and tractor segments," says Milan Bavishi, head of research, Inventure Growth and Securities. "Any cut in interest rates will be positive for the sector," says VK Vijayakumar of Geojit BNP Paribas Financial Services. Lower interest rates will encourage people to take loans to buy vehicles. Maruti Suzuki has risen 57 per cent to Rs 1,473 this year till November 30. Tata Motors, Cummins India and Mahindra & Mahindra are up 49 per cent, 41 per cent and 40 per cent, respectively. Bavishi is positive on Mahindra and Mahindra, Tata Motors and Bajaj Auto due to their diversified portfolio, wide distribution network and presence in major countries. Investors can expect to earn 15-20 per cent in the next one year from these stocks, he says. HEALTH CARE: The BSE Healthcare index has risen 35.58 per cent this year till November 30. India's pharmaceutical companies earn nearly 50 per cent from exports. Rupee depreciation has immensely benefitted companies such as Sun Pharmaceuticals, which generates nearly 50 per cent revenue from exports, and Ranbaxy, Dr Reddy's Laboratories and Glenmark Pharmaceuticals, which earn nearly 70 per cent from exports. The rupee has fallen over 3 per cent to 54.94 this year. "The sector is likely to do well in 2013 due to strong dollar, long pipeline of applications under the Abbreviated New Drug Application (ANDA) route by Indian companies and launch of exclusive products ($12-13 billion worth drugs will go off-patent in 2013)," says Shraddha Shah, research associate, Nirmal Bang Securities. ANDA is an application for US generic drug approval for a licensed drug. Between January and November, Wockhardt has risen 478 per cent to Rs 1,601, followed by Strides Arcolab (183 per cent to Rs 1133), Aurobindo Pharma (118 per cent to Rs 188), Ipca Labs (65 per cent to Rs 456) and Glenmark Pharma (51 per cent to Rs 436). From the list, experts are positive on Wockhardt, Cipla and Ajanta Pharma. According to an Emkay Global Financial Services report, 31 per cent CAGR in earnings and reduction in net debt to zero will drive re-rating of the Wockhardt stock from 15 times to 18 times 2013-14 earnings. The stock can touch Rs 2,160 in the next few quarters. Shah prefers Cipla and Ajanta Pharma. Since the start of 2012 till December 3, the two have risen 152 per cent and 29 per cent, respectively. In 2011-12, Ajanta Pharma and Cipla booked net profits of Rs 66 crore and Rs 1,123 crore, as against Rs 46.45 crore and Rs 960.39 crore, respectively, in 2010-11. CAPITAL GOODS: In 2011, the BSE Capital Goods Index fell over 47 per cent. Till December 4 this year, it is up 38 per cent. "The major reasons for the sector's stellar performance in 2012 are optimism about the resumption of capital expenditure and incremental steps being taken by the government to tackle issues in the power sector," says Pezarkar of Daiwa. Decisions to set up a panel to fast-track big investments and focus on clearing stuck projects have improved sentiments. Shenoy of Motilal Oswal Securities says, "Most capital goods companies are still trading at affordable levels compared to their earnings potential. The Capital Goods index will continue to do well if the risk appetite remains at elevated levels." Over the next 6-12 months, Angel Broking is bullish on Crompton Greaves. It said in November that the company was expected to register a healthy 12-14 per cent growth in sales year-on-year on the back of a strong order book. The stock is attractively valued (0.5 times 2013-14 enterprise value/sales compared to the five-year trading range of 0.7-1.6 and the median of 1.2x). It can touch Rs 145 in the next few quarters with a multiple of 0.7 times enterprise value/sales. On December 5, it was at Rs 120.